Tutti Designs: Frilly Flower Frame. 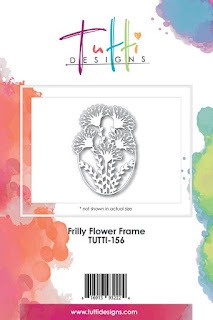 Hello everyone welcome to Tutti Designs Wednesday blog Post. Today I am sharing my card using one die from New August Release. available now! And what a stunning collection this is. I have cut two Frilly Flower frames. top one has been coloured with distress inks. "Peacock Feathers" "Gathered Twigs" "Black Soot"
Applied with a sponge dauber, glue and diamond sprinkles glitter. Next Adhere together the frame and leaves only! these frilly flowers I applied hot glue behind the filled in base flower, you could use 3d foam if you prefer. This I adhered to a white die cut oval frame. 7"x 6" Top opener (tent) card. Added a chiffon bow with string pearls with hot glue. This card is really quick to make and can be used for so many occasions. Created for Tutti Designs by Pam Simpson. Thank you for stopping by Tutti Blog will be back next Wednesday Pam x. Morning Pam, Absolutely beautiful !! I love the flower die-cuts and I love how you have coloured and glittered them, positively beautiful. WOW! Simply beautiful Pam! Love the soft blue color and your composition is fabulous! Well done my friend! Pam: I just love the blue colors and then added some browns to the bottom of the flowers. Just came out gorgeous. Pam, you did a fabulous job shding these die cut flowers. Love the peacock color especially! !